Ever since Börlind was founded in 1959, the company has focused on natural substances in the products it makes. In 1965, Börlind GmbH became a contracted supplier for “neuform” (Association of German Reformhaus health stores), the “neuform” trademark certifying that Börlind’s products complied with the guidelines of the German Reformhaus health stores, both from the point of view of quality requirements and of the ingredients deployed. However, this – like the seals from the BDIH and NATRUE now in existence – only applied to the products. What is important to Börlind is an evaluation and a certification of the company as a whole. CSE (Certified Sustainable Economics) stands for responsible ecological, socially integrated and quality-oriented company management. 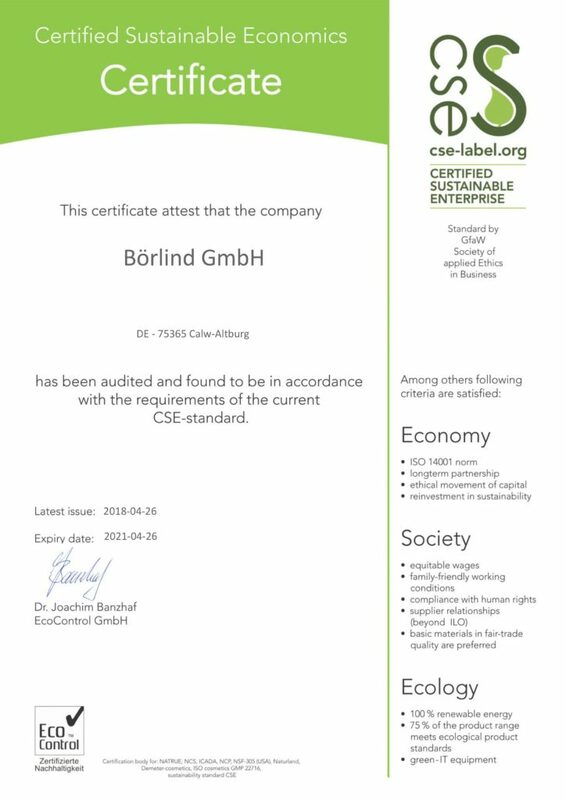 Manufacturing companies certified in line with the CSE Standard produce at least 75 % of the bulk of their products in accordance with an existing sector-relevant product standard (NATRUE, COSMOS, BDIH, Soil Association, COSMEBIO, ICADA, demeter, Naturland, VIVANESS 2011, natural cosmetics regulations of the Austrian Codex Alimentarius, NCS). By the way: The CSE label has been rated as “highly recommendable” for its criteria, independence, verification and transparency by the German platform label-online.de! The global inspectorate and certification body, EcoControl, coordinates CSE certification and issues the certificates. You can learn more about CSE certification and the pioneering work Börlind GmbH has accomplished in collaboration with other enterprises and the German Society for Applied Business Ethics, in the brochure “Pioneers of Sustainability. Comprehensive and Dynamic: CSE Certification” – available in German only. The CSE certificate confirming compliance to the provisions of the current version of the CSE (Certified Sustainable Economics) Standard. 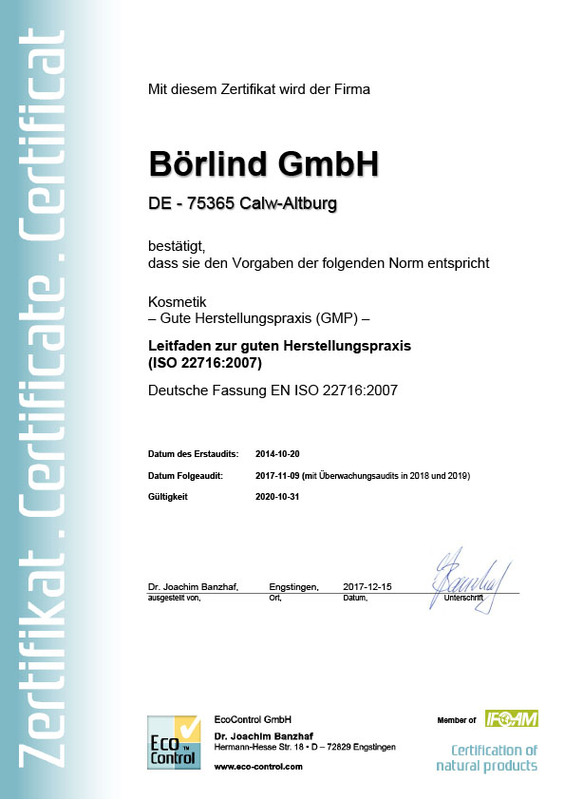 Börlind GmbH has been certified for its Good Manufacturing Practice (GMP) in accordance with ISO 22716:2007. Guidelines that must be observed in the manufacture of cosmetics are firmly anchored in this international standard. The guidelines apply to the different areas of the manufacturing enterprise that influence product quality. Certification according to ISO 22716:2007 therefore testifies to standard-compliant quality management and is proof once again of the high quality of Börlind’s products. 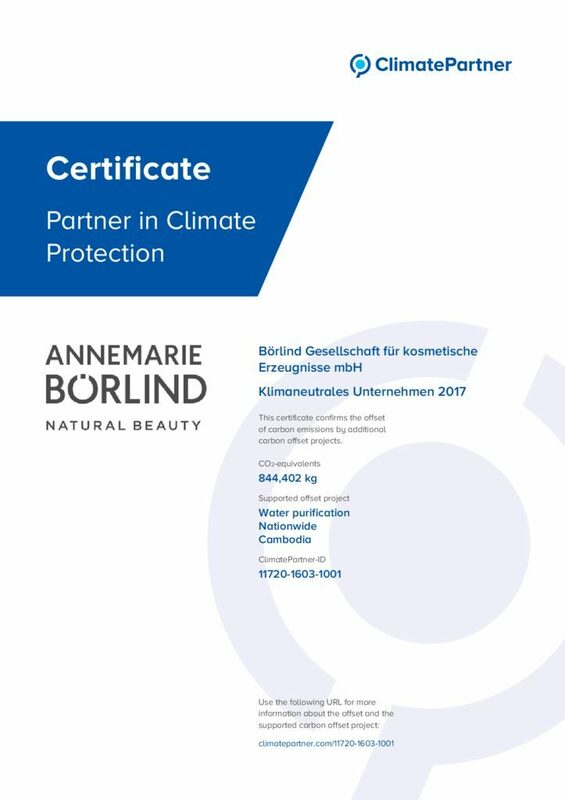 ClimatePartner has certified Börlind GmbH as a 2017 climate-neutral company. The cosmetics company compensated for its greenhouse gas emissions equivalent to 844,402 kg CO2 by supporting the “Water Treatment in Cambodia” climate protection project.